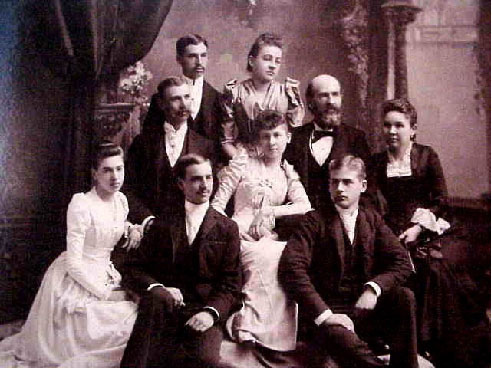 The Houghton-Donner Family, on the front porch of their glorious Victorian, late 1880s. 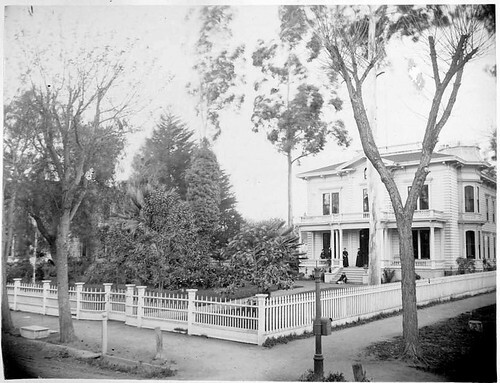 This view is of its original location ~ the corner of Julian and North Third Street, San Jose, CA. It was moved to its present location in 1909. On July 19th, an irreplaceable piece of San Jose history went up in flames. 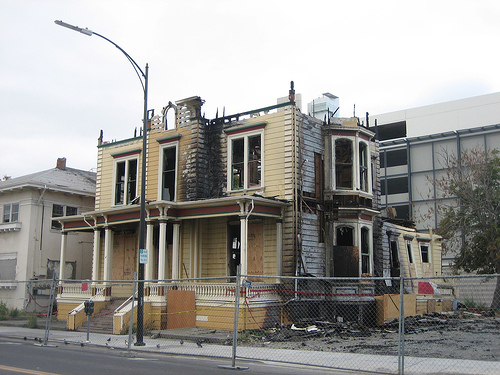 SAN JOSE, CALIFORNIA: The 126-year-old Houghton-Donner House, built for a member of the Donner party succumbed to fire, turning centuries worth of California and San Jose history, and at least a decade worth of contentious redevelopment arguments, into ashes. Personally, I am deeply saddened by the loss of the house, as I was present for many discussions of its fate during Preservation Action Council meetings in San Jose at the Petit Trianon, another downtown beauty. By the time firefighters arrived shortly before 4 a.m., the “highly suspicious” blaze had fully engulfed the Houghton-Donner House on North Fourth and East St. John streets. Preservationists and developers later tried to carefully dismantle the 5,000-square-foot home’s charred facade to see if it could be saved and incorporated into other buildings. The house is considered by some to be “the most historic building in San Jose,” Fire Chief Guerrero said. The investigation into what sparked the blaze is ongoing. 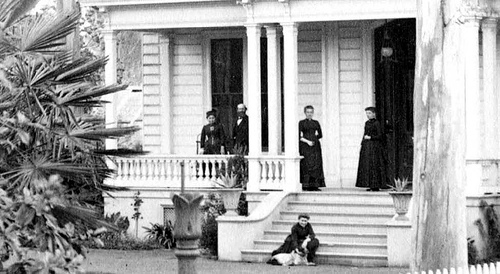 The house was built in 1881 for Eliza Donner – a survivor of the Donner Party, a group of early California settlers caught in a deadly blizzard in 1846 trying to cross the Sierra – and her husband Sherman Otis Houghton, San Jose’s fourth mayor, a lieutenant colonel in the Civil War and a Republican member of the U.S. House of Representatives. The home embodied the Victorian architecture of the time and was placed on the National Register of Historic Places in 2002. Not only was the building a significant piece of California history, it was an aesthetically pleasing part of the urban fabric of downtown. It always looked a little sad, not being used to its full potential. However, the building did receive an attractive “painted lady” paint job, while it languished. San Jose police were the first to arrive on the scene, escorting squatters from the building. While some older downtown homes have been expensively rehabilitated, others are largely vacant except for homeless people who sneak into the buildings at night and apparently set fires for heat and cooking. Fire Chief Guerrero said he considered the fire to be suspicious, due to the fact that the Victorian was boarded up with no electricity and no gas. Police had received complaints about squatters using the Houghton Donner House after Keith Watt sold it in 2005. Both Henry Cord, a representative of current owner Tony Baig, and former owner Keith Watt said they had done everything possible to keep unwelcome people out of the home. Although the windows were boarded up, people apparently continued to break in. Why does San Jose leave its historic homes vacant for so long, turning them into attractive shelters for squatters? I’ve been working for a year and half to two years trying to save the house,” Cord said. 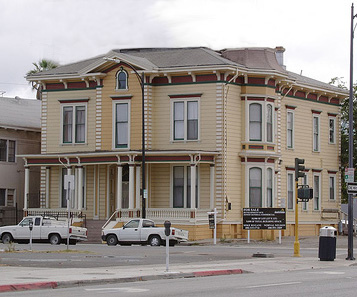 Keith Watts and the Preservation Action Council vigorously fought a 2002 city proposal to move the home to the Hensley District to make room for a parking structure on the corner of Fourth and St. John. Although they eventually stopped the plan, the fight drained the money that Watts had planned to use to rehabilitate the home. He ultimately sold it. Cord spent at least a year and half working with community groups to gain support for the renewed idea of moving the home. The application to do so is currently on file with the city. “It has been a real hot potato,” Bellue said. But Cord believed he had the city and community support necessary to make the move this time. Baig made concessions to community demands, agreeing to keep the house as a home instead of turning it into commercial real estate. Bellue said the Preservation Action Council has remained opposed to moving the building but had been rethinking its stances in recent years. Real Estate Investors – where is the GO Zone? I do have my finger in quite a few pies, as you will see, and today I thought it would great to enlighten folks on some tax laws that have come out to help the Gulf Coast areas that were hit by the hurricanes. They also apply to investors, who would like to invest in the new construction in these areas (or do renovations on the historic properties). The “GO Zone” is the Gulf Opportunity Zone and it applies to properties purchased after August 27, 2005 and before January 1, 2008. Expensing for Small Businesses Increased. Certain small businesses affected by Hurricane Katrina can annually deduct up to $200,000 in qualifying property expenditures made in the disaster area. Special Bonus Depreciation to Help Businesses Rebuild. Businesses of all sizes affected by Hurricane Katrina can take a special first year depreciation deduction for qualified property placed in service after August 27, 2005, and before January 1, 2008. The special deduction is equal to 50 percent of the property’s depreciable basis. Deduction for Demolition and Clean-up Costs. Taxpayers may choose to take a deduction for 50 percent of any qualified GO Zone clean-up costs that would otherwise be included in the basis of property. Net Operating Loss Carryback Extended. The carryback period is extended from two to five years for net operating losses attributable to Hurricane Katrina. This provision will allow some businesses affected by the hurricane to obtain a refund of taxes paid in earlier tax years. Work Opportunity Tax Credit for Hurricane Katrina Employees. The Work Opportunity Tax Credit provides businesses with an incentive to hire individuals from groups that have a particularly high unemployment rate or other special employment needs. Income Exclusion and Employer Credit for Housing Employees In the Region Affected by Hurricane Katrina. Up to $600 per month is excluded from an employee’s income for employer-provided housing in the region affected by Hurricane Katrina. Employers are also entitled to a significant tax credit for providing such housing. Read about all this in greater detail on the IRS Website. Think about the implications of this. If you have a huge tax bill this year, OR if you had one for the past 5 years, you can use the 50% depreciation credit to offset it! Amazing! The kicker is, when you sell the property you’ll have to pay it back to the government, but if you hold it for 7 years, you won’t. As everyone knows, Biloxi, MS was pretty much decimated, at least at the coast. There are tons of new buildings going up, even as we speak, and they don’t have the levee problems that New Orleans has.